handling the majority of your moving day jobs. It also has a corrosion and rust resistant frame and can convert from a 2 wheel to 4 wheel dolly with a simple locking mechanism. CONS: some complaints of wheels not lasting after repeated use, lightweight in design, not durable over time, not shippable outside of the USA. It says 400 lbs weight capacity but we suggest not to use it beyond 100-150lbs. Usually, the weight capacity indicates the maximum weight limit but a dolly should never be used its maxed out weight limit. This will cause structural damage and will shorten the lifespan usability over time. This is the big brother to the 400lb capacity convertible Harper Hand Truck/ Dolly. It consists of the same I-Beam glass filled nylon frame which is 30% lighter than steel making this dolly combo very lightweight and portable. The frame construction also protects the dolly from corrosion and makes it rust resistant. The rear wheels are now a 10″ pneumatic with 5″ heavy-duty swivel casters in the front. 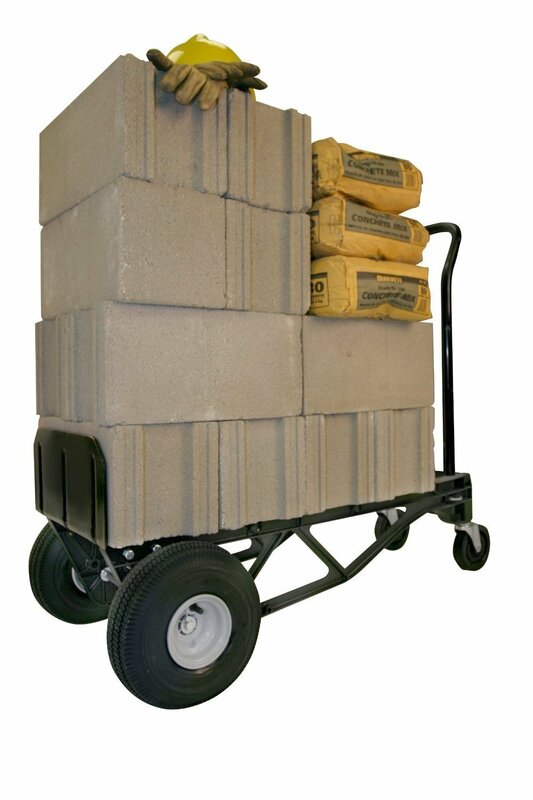 PROS: convertible from 2 to 4 wheel dolly and cart, heavy duty weight capacity up to 600 lbs when careful. 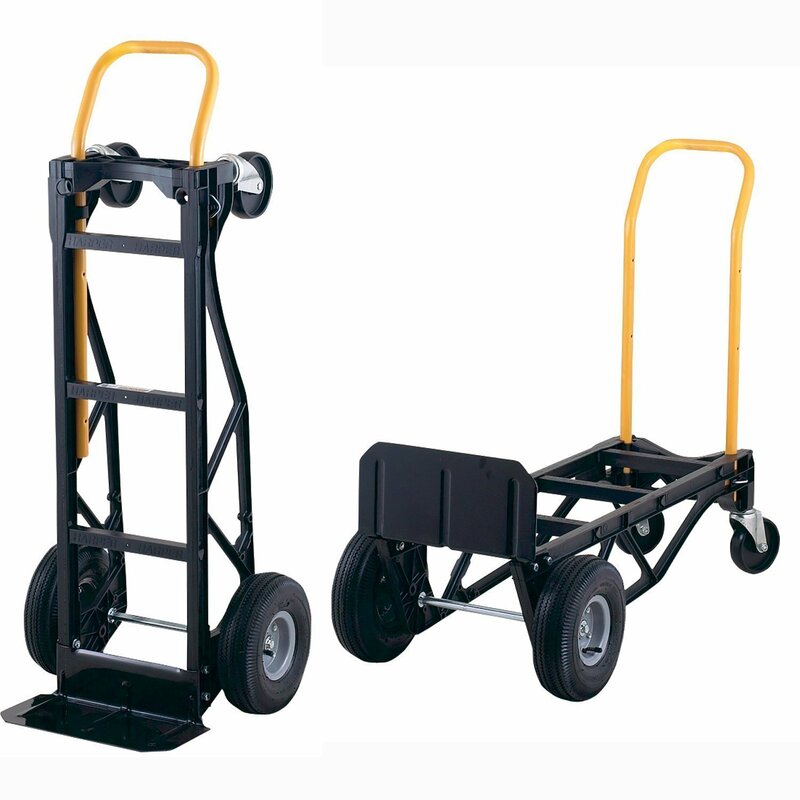 These lighter frame dolly trucks are good to their weight capacity however, they not meant for rugged use. The best features are its convertibility and convenience in portability. We recommend this for a basic move and also for basic jobs around the house. It is not meant for extended use over time. 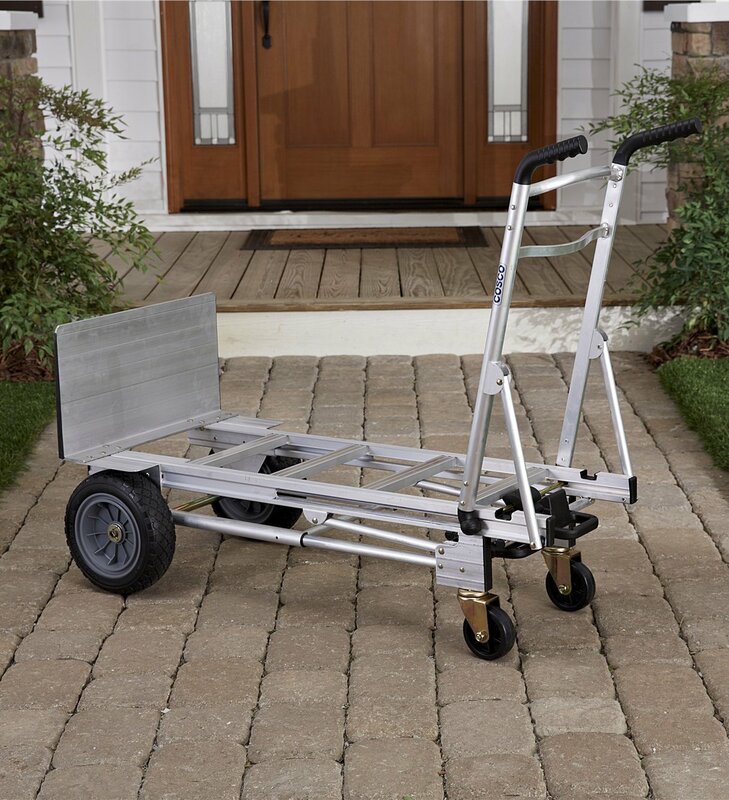 Since moving only takes a day or two and not something we do all the time, this could be a great option for those wanting to use a higher weight capacity dolly but one that isn’t so heavy to lug around a move site. RECOMMENDED: For small to medium capacity work – this is a great value moving dolly! It is a bit on the heavy side of 33 lbs but it only assures you of its steel tube frame and heavy-duty capacity. The maximum weight load is 600 lbs with a loading area of 32 cu. ft. 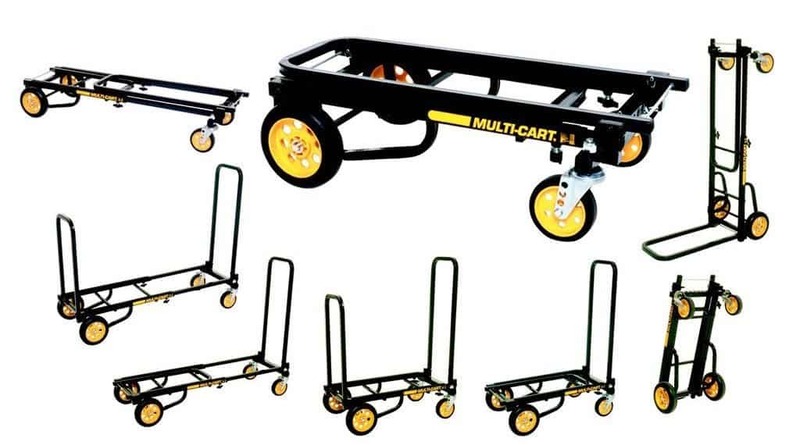 Although this cart was designed for carrying around stage equipment, it can also serve a good purpose for moving. It was designed with multiple uses in mind so it will definitely endure the short runs of moving. Also, the foldable and convertible features give it an advantage for multi-purpose usage. Not really meant for a long time consistent use since it has a lot of moving parts. However, great for occasional goto jobs. 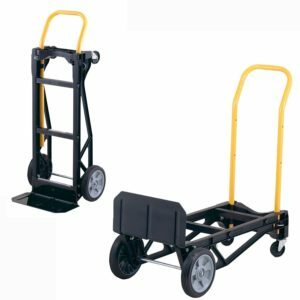 RECOMMENDED: To be a goto dolly/ cart with features for multi-purpose usage even after a move – this moving dolly is worth considering. For an all-around workhorse, you can’t go wrong with Magliner. This hand truck features a high arched handle with a diecast nose plate and stair climbers. It has 10″ pneumatic wheels and the aluminum nose plate is lighter than steel and rust and corrosion resistant. CONS: does not convert to flatbed design, wheels may need ongoing maintenance depending on weight capacity usage. Stair climbers are a must if you are planning to use this to move larger objects up and down stairs. The larger wheels pair well with ramp usage as well. The higher handle creates better leverage for larger loads. It can hold up to the stated weight capacity and great for commercial use as well. RECOMMENDED: For the larger objects and for going up and down stairs. If you know how to use a larger dolly, then this will be a great fit for you. Not ideal for larger appliances thought. 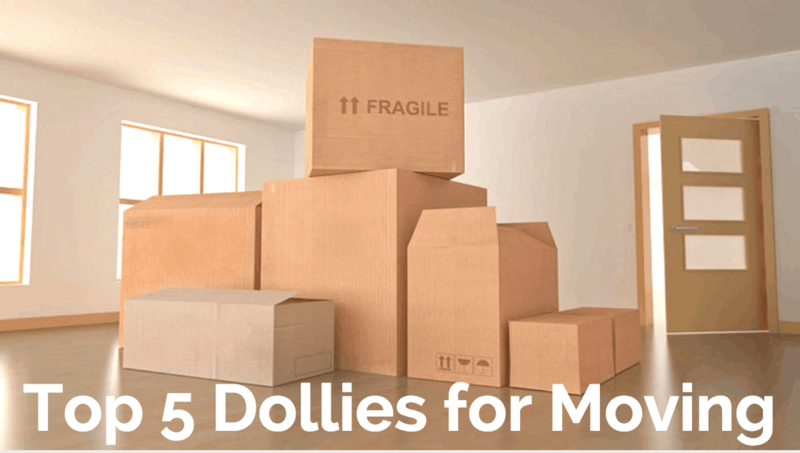 The ultimate moving dolly for small appliances. It has a large capacity overall design with heavy-duty flat free wheels. The innovative design allows for stress free usage from each adjusted position. 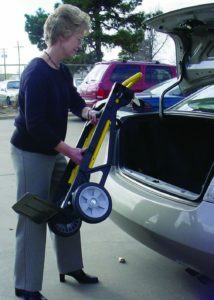 It features a 1000 lbs flat 4 wheel cart and an 800 lbs capacity 2 wheel design. CONS: like all heavy duty dollies, wheels may need maintenance over time, load capacity has been reported as not living up to advertised. We recommend this hand cart for small appliances. With each move, it is essential to have something to match the load capacity of your heavier objects without breaking the bank. Cosco products are known for their quality and durability. The downside with a lot of these dollies is their wheels. The front casters are a bit on the smaller side and the weight capacity may a little over estimated. However, if you have a larger home with a number of heavier objects, then this 3-in-1 dolly cart will definitely serve its purpose. 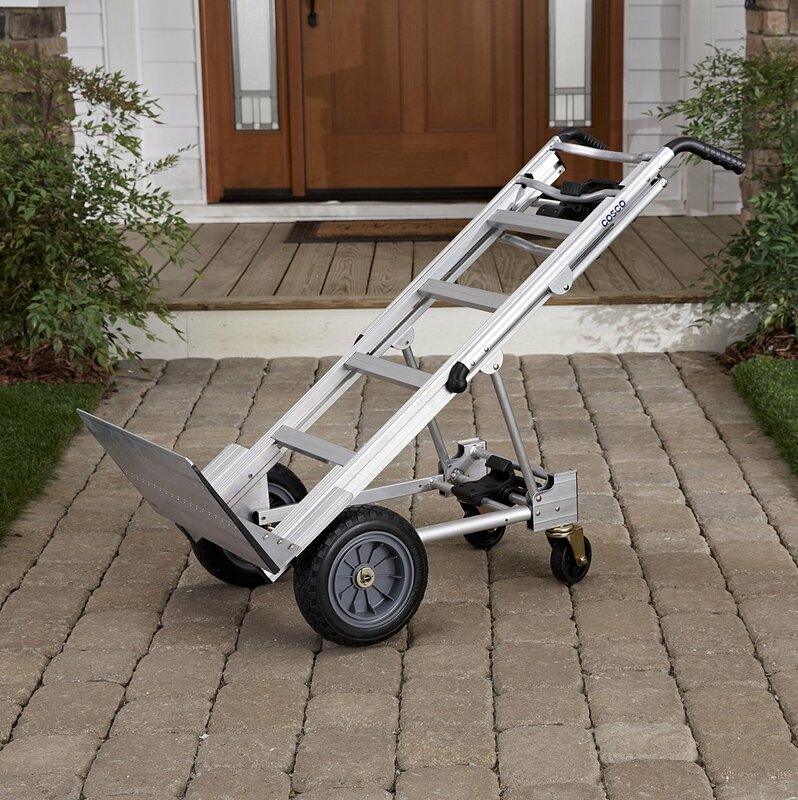 RECOMMENDED: For appliances and well balanced weight loads, this moving dolly makes a great value.